Every photographer knows what it is like to work on the weekend. There is no such thing as a 9am to 5pm photographer who works only on weekdays. Our job requires us not only to work late nights, but often photograph or edit on Saturday and Sunday. Most companies that serve photographers, however, take their weekends off because that is the standard way of doing things. At one of the business meetings, the Pixellu team realized that photographers often need help not just on the weekdays, but also on the weekend. With our current support hours, a photographer who has a question at 6pm on a Friday would not receive help until Monday morning. That is a whole two and a half days! Even though this is acceptable in “standard” business practice, we do not want to be a “standard” company; we want to be an extraordinary company, and provide our customers with extraordinary service. After a short discussion we realized that to truly serve our customers well, we need to extend our customer support to the weekend. And so starting immediately, Pixellu will provide support seven days a week. 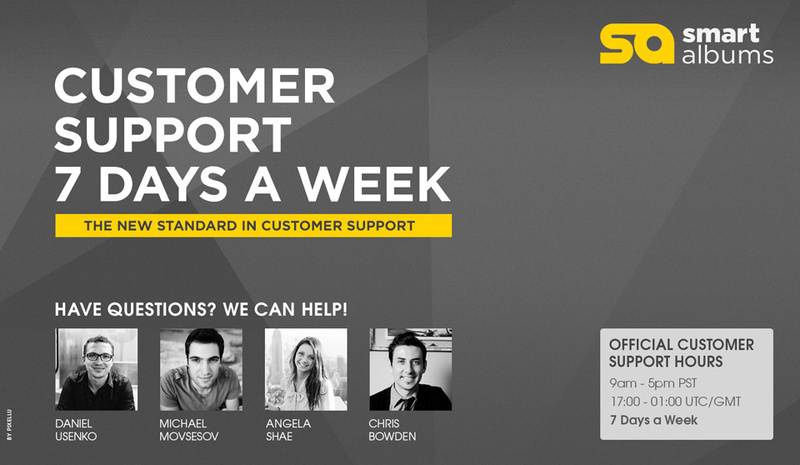 From the hours of 9am to 5pm Pacific Standard Time, we are here for you every single day. We hope that this decision will help improve your experience with SmartAlbums and our company as a whole. If you have suggestions on how we can serve you even better, please let us know. Our goal is to have the best customer service out of any company you have ever dealt with.